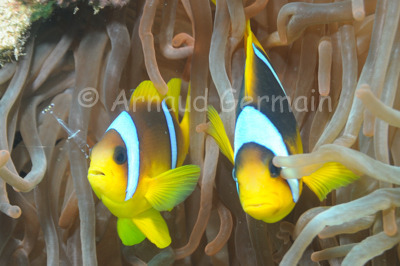 For most divers, watching a clown fish in an anemone is a highlight of a dive. I have pushed that further as very often, they associate with the long arm cleaner shrimp. If you approach slowly your hand, these shrimps very often give you an underwater manicure. I wanted to show the association between the shrimp, the clown fish and the anemone with this shot.